At the Arbeitskreis Meteore (AKM) spring meeting in March 2018, we discussed an observation made by Jörg Strunk during the “US eclipse” from August 21st, 2017: A 22° halo was visible in cirrus clouds around the sun up to around half a minute before the onset of totality. Similar observations have already been discussed in a paper by G. Können and C. Hinz from 2008. 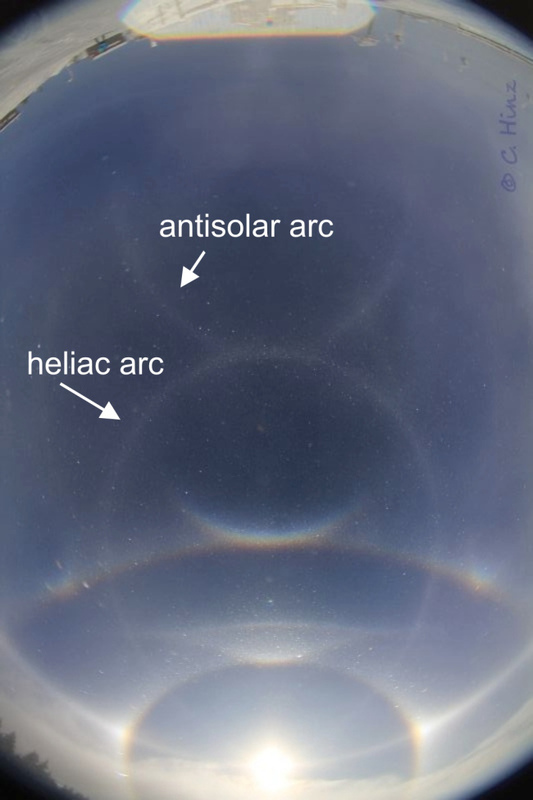 In this publication, it is mentioned that an initially very bright 22° halo could stay visible throughout the totality, created only by the light of the solar corona, and standing out against the twilight-like sky background. The question I want to address here is: How would such a halo look – similar to the ones we know, being created by ~0.5° large, disk-like sources such as the sun or full moon? Or more diffuse due to the larger angular diameter of the corona? The calculations themselves are carried out in two steps: At first, I let a deep simulation (300 million rays) of an ordinary 22° circular halo run in HaloPoint 2.0, but using a point source instead of the usual sun disk. Next, each color channel of the simulation is convoluted with a matrix resembling the source’s intensity distribution. For this purpose, the brightness function was cut off at 7 solar radii (1.9° from the central point of the disk, assuming a radius of 0.27°). This approach is of course only justified as long as projection distortions can be neglected, i.e. in the vicinity of the projection center, otherwise a more complicated calculation involving spherical coordinates is required. Here, the field of view from the center to each edge amounts to about 29.0°, and the simulations are presented in Lambert’s equal area (azimuthal) projection. Under these conditions, the distortion error remains indeed small. The angular resolution is about 0.06°/pixel, as determined by the HaloPoint program. The intensity distributions for the various light sources are depicted below: a) point-like, as assumed for the simulation, b) the non-eclipsed sun, dominated by the photosphere disk, and c) the corona with the photosphere blocked by the moon. The ratio of the integrated intensities between b) and c) amounts to about 900000. The resulting 22° halos are shown in subfigures d)-f), normalized each to the brightest pixel, and with zoom views of the left rim provided in g)-i). The integrated halo intensities scale with the same factor of 900000 as does the illumination. The most prominent feature is the red double rim in f) and i), clearly a consequence of the ring-like source. 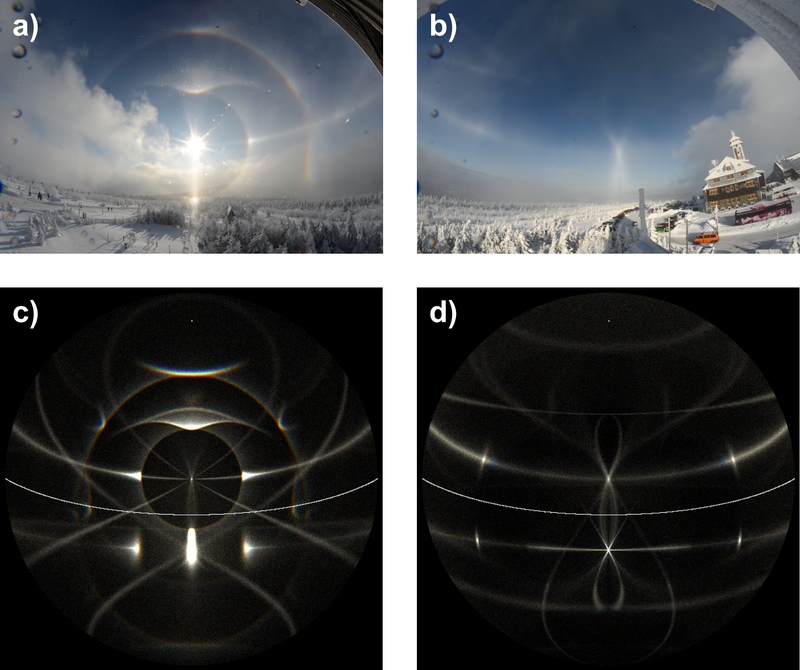 But, even if the sky background illumination during the total phase permits a halo observation, it is not guaranteed that the double rim becomes visible, as diffraction is not accounted for in the halo simulation. 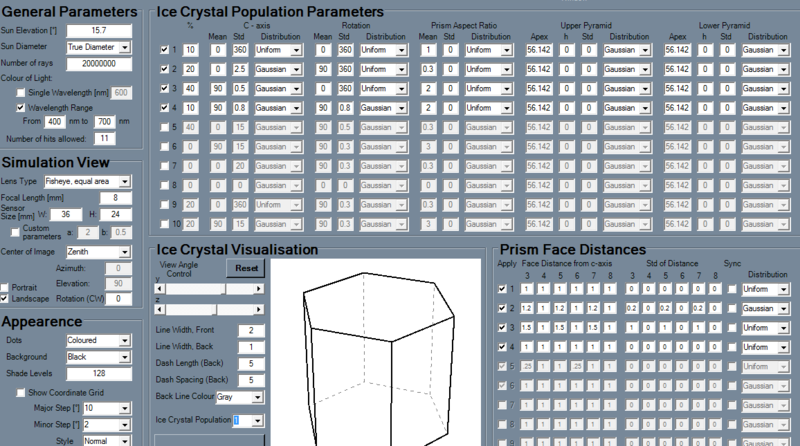 Diffraction blurring decreases with increasing crystal size, which implies that the crystals have to be larger than a certain minimal value to allow finer halo features to be observed. For a rough estimation, it is possible to rely on the diffraction pattern of a single slit. The main peak has an angular full width at half maximum (FWHM) of about λ/b, with b denoting the slit width. For λ = 600 nm, and requiring that the FWHM should be smaller than 0.5° (i.e. roughly the distance between the two rims), this means that b has to be larger than 70 µm. This value corresponds to the width of one prismatic face of a hexagonal crystal, projected under the angle of incidence (about 41°) for minimal deflection. The corner-corner size of the hexagon equals then 2.6⋅b, i.e. the minimal crystal diameter amounts to about 180 µm. Finally, it should be remarked that a double rim halo can also result from an annular eclipse. The chances for detection should be even better than for a corona halo, as the background contrast would not be much worse than for the non-eclipsed sun. In this situation, the azimuthal homogeneity of the source will also be much better. For the corona, this is only a rather crude approximation and under realistic circumstances this implies that the splitting of the corona halo might become prominent only at certain positions along its circumference.